This is a popular place in San Francisco for a snack. 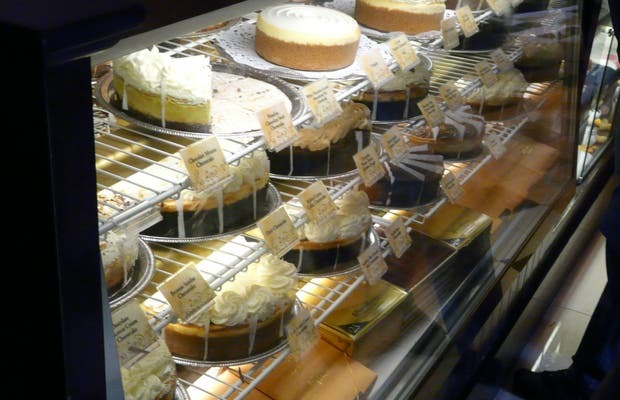 They have typical American food, of course, but the most popular order are the cheesecakes. They're spectacular! Expensive and huge, but spectacular nonetheless. Treat yourself to one and you'll see what I mean. It's a chain, but this is the flagship one, in the heart of Union Square and with great views at the top. The Cheesecake Café is across from Union Square on top of the Macys. It has a fantastic terrace that allows you to see the city from above. Yes, it's always full of tourists and usually on the chilly side on the terrace. I love this restaurant. I discovered it when I was in San Francisco. The menu has a huge variety (pasta, salads, meat, specialities, burgers etc. ..) and for dessert ... The best pies in the world. It has a great location, and has a spectacular terrace, as this in the attic of Macy's in Union Square.